The Merit Fitness 725T Plus Treadmill is a state of the art exercise machine that allows for the user to walk or run with leisure. Having two cup holders, an LED light display, 2.25 horsepower motor drive, and a dark blue framework, the 725T is not only functional, but it’s aesthetically appealing. 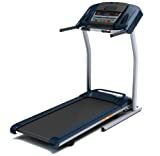 A consumer of this product is allowed to move at the speed (s)he desires along with other key features that allow the user to walk with ease such as being able to control the incline of the treadmill and the ability to choose different types of workouts to accommodate for the user’s desired goal. The product came to market in 2010, and its current price on Amazon is approximately $449 with free shipping even for non-Prime users. All in all, this product is great for people who desire to lose weight, become a more proficient runner, or keep their heart/lungs in top notch condition. LED screen that allows the user to easily see the settings in case alteration is needed. Adjustable speed ranging from 0-10 miles per hour. Is compatible with MP3 players and even has speakers. 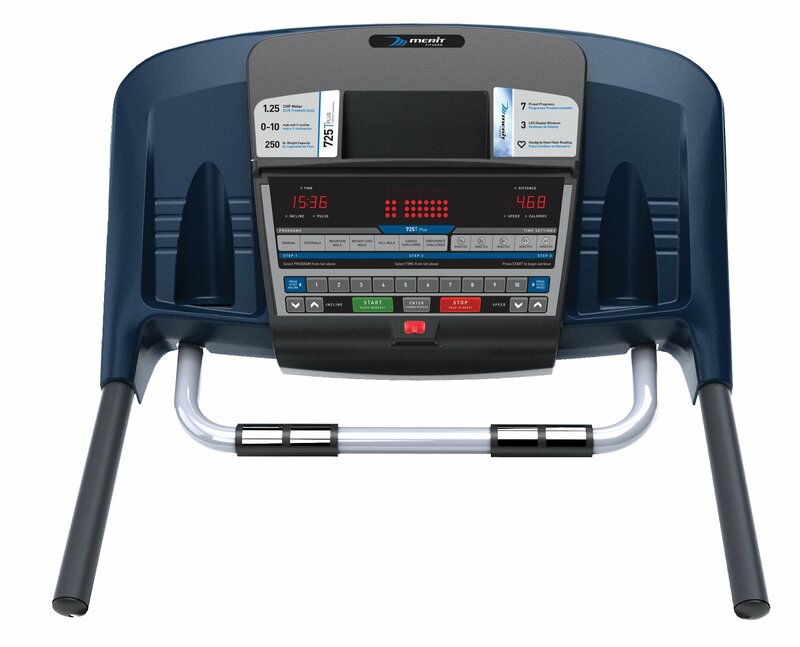 The 725T is one of the top tier treadmills on the market. Weighing 121 pounds, the 725T is easily transportable from one area to another to allow for easy storage or redecoration. In addition, the 725T has an expanded dimension 31 by 52 by 71 inches (W x H x D) and a folded dimension of 31 by 53 by 34 inches (W x H x D) which entails an easy storage routine due to the little space it takes up and how easy it is store the 725T in an isolated area if necessary. There are two displays on the treadmill each with LED lighting which allows the user to easily find a setting that needs to be altered when put into a situation where they’re tired out from a run and want to ease up the conditions. The display gives the user leisure in having their data tracked so it’s easy to see how long, far, and intense one has exercised. The display also shows the user’s puls, when they keep their thumb pressed on the pulse monitor, and shows how long they have been exercising along with the distance they have walked and the average calories they have burned. The pulse rate monitor is great for indicating whether the user is working too hard or not hard enough. If a user is fond of listening to music while they exercise, the 725T allows for the user to easily hook their MP3 player and the speakers will project the music. The framing of the 725T is also made of steel which ensures that the structural integrity of the machine has minimal deterioration. The Aerosoft cushioning system below the belt isolates from legs and feet from shock which decreases the chances of injuring oneself, along with the emergency red clip that can be attached to one’s article of clothing which automatically shuts down the treadmill if the user is pushed back too far. As always, the treadmill comes with a few preprogrammed workouts to accommodate the user for specific goals and adjusts the incline and speed accordingly. The 725T does, however, lack in a few areas that may need to be addressed. The treadmill does not come with a built in fan if the user ever feels the need to cool him/herself down in the middle of a workout. The weight capacity for the 725T is also 250 pounds which could deter users of large proportions, whether from muscle or fat, from being able to safely use the product. Another issue that may need to be addressed for runners of higher caliber is the speed adjustment for the treadmill. Having a maximum of only 10 miles per hour, the 725T may not be able to accommodate for people who enjoy a long sprint and seems to mostly accommodate for people who only enjoy a casual jog. According to testimonials from other users, the noise level is not particularly quiet either. The treadmill by itself is already said to be a bit loud, but the impact from one’s feet hitting the belt when running adds to the volume. Testimonials stated that the magnet connecting the emergency mechanism is fairly weak, and if the magnet becomes detached, the user will lose all the recorded data which could be a nuisance. The Merit Fitness 725T is a top tier treadmill. It has many virtues that indeed make the purchase well worth one’s money. However, there is no doubt that some of the drawbacks for the treadmill may not be able to accommodate certain users well, especially ones the desires a more intensive workout or perhaps heavier users. The LifeSpan TR 1200i Folding Treadmill allows a slightly higher speed of up to 11 miles per hour but does have an incline that could be adjusted by 5% more and has a higher weight capacity. However, the merits certainly outweigh the drawbacks of the 725T. The user still has major disclosure over many components of the vehicles such as having ease with altering the incline and speed and very efficient record tracking capabilities. Along with the control, the compatibility with certain MP3 players also appeals to many users. Although the emergency mechanism can be a bit peeving, the user can deter any conflicts if they stay a bit more cognizant of the condition of the magnet. All in all, the merits outweigh the drawbacks, and the 725T is definitely worth the price.